Our car wash equipment and systems are dependable and simple to own & operate. Our goal is to help every operator build a successful operation. We hope you will come to think of us as your "total" car wash industry supplier. Ultimate Washer is proud to offer coin meter and bill meter boxes made is U.S.A. Quality bill acceptors made by Coinco or Mars are known in the industry as the benchmark for long life and reliability. These meters are able to detect foreign coin and bills while provided an increased acceptance of damaged bills and coins. Both the coin meter and bill meter can be programmed to accept foreign currency or coin if desired for international customers using them for car wash systems outside U.S. 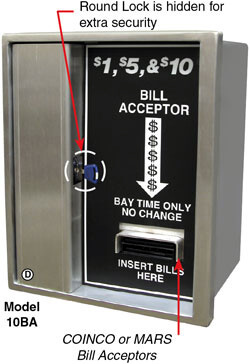 Coin and bill acceptors are a necessity for car wash, boat wash, or any vehicle wash application. Studies find that it takes a population base of 1000-1500 people to support 1 self-serve bay. (A town of 5000 people could theoretically support a total of 5 self-serve bays between all competitors.) At this population level the National Average is approximately $1350 per bay, per month of gross income for one self-serve bay. (This is an estimate average only, incomes can and do vary.) National average of vending revenue is approximately $347 per month gross revenue based on offering at least 4 different vending products. Depending on specific codes your building should be placed on the lot to allow for 1-2 cars minimum to be "stacked" behind each bay waiting to wash. Vacuums can be placed in this area but should not impede the normal flow into the bays. Make sure there are adequate drying and vacuuming areas that are out of the main traffic flow. Ideally your bays should have a southern exposure to help reduce ice build-up in cold weather conditions. Local codes will also have "set-back" requirements on building placement. In many rural locations washes can be built with an open outside bay for trucks, trailers, tractors, etc. However, as a rule an outside bay will bring in only about 40-50% of the revenue of an inside bay. It is always better from a revenue standpoint to enclose all bays and build one larger if you feel you will have adequate truck traffic. This bay then can also be used for cars if other bays are busy. No Guarantee of income, expenses or profits is made or implied by Ultimate Washer. Population, location, building layout, management strategies, climate & competition can all have a great impact with regards to this information and how it affects your business. Precision die-cut stainless steel cabinets give a uniform fit and a finished look. Bill acceptor bay meters are designed to be used with your existing bay meters. Simply wire to your meters and accept $1, $5, $10 bills in addition to the coins that you have accepted in the past. You can determine which bills you wish to accept. Programmable for foreign currency also. Increases profits due to high acceptance of valid bills including wet, torn, and damaged bills. Offers superior bill handling and increased acceptance. Accepts all new bills. MARS bill acceptors for reliability. Note: Locate away from middle of bays to limit water over spray. Heavy duty stainless steel construction with removable front doors for easy access makes our coin meters a great choice for your public use vehicle wash. 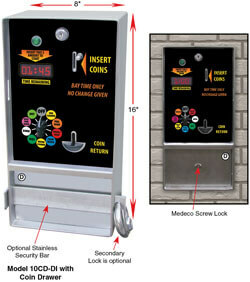 Coin meter boxes come standard with stainless steel security bar for extra protection on coin drawer models. Units are available in either built-in coin drawer or less coin drawer to be used with a vault/safe system. Timers are only included on digital or last alert models. Coin mechanism come in your choice of mechanical or electronic options. Another optional item is a digital timer and how many switches you need for your selector. We can order custom decals for your coin meter too, to include your company logo. Call for details and pricing.